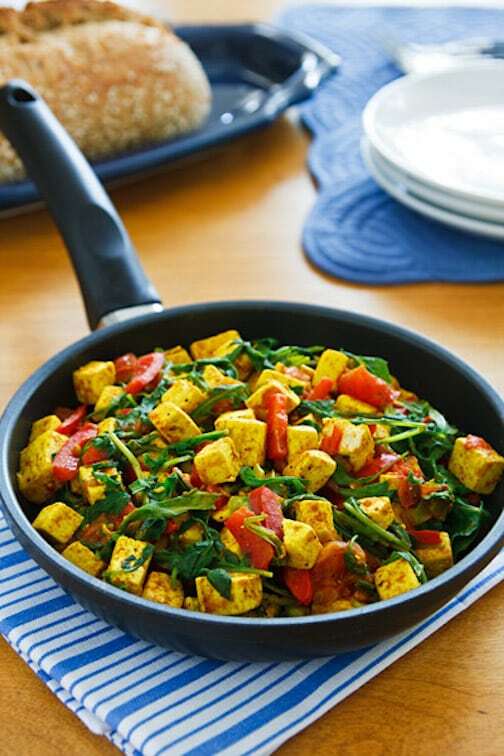 Here’s a colorful, tasty tofu scramble with plenty of healthy spinach or arugula and red bell peppers that’s festive enough for a company brunch (double the recipe in that case), but simple enough to make for a weekend meal for you and yours. Adapted from Vegan Holiday Kitchen. Photos by Susan Voisin. Cut the block of tofu into 6 equal slabs. Blot well between layers of clean tea-towel or paper towels. Cut the slabs into 1/2-inch dice. Heat the oil in a wide skillet. Add the tofu and bell pepper and sauté over medium heat, stirring frequently, until the tofu is touched with golden spots on most sides and the bell pepper has softened. Sprinkle in the seasoning, curry powder, and turmeric, and stir until the tofu dice are more or less evenly coated with the spices. Stir in the scallions and tomatoes and cook for 2 to 3 minutes, or until softened. Add the spinach or arugula, cover, and cook until wilted. Stir the spinach into the tofu mixture. Remove from the heat, season with salt and pepper, and serve from the skillet. 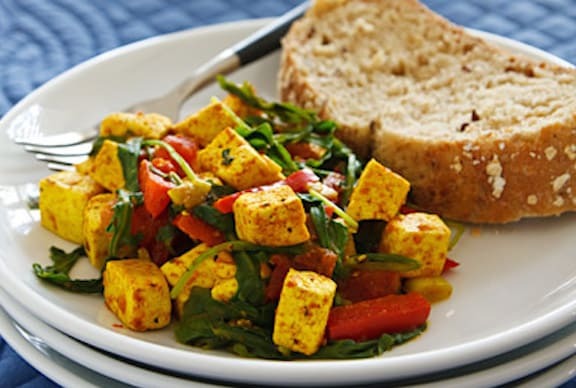 Here are more easy, versatile tofu recipes. Enjoy more healthy spinach recipes. … and more Easy, Festive Vegan Brunch Recipes and Menus. Hi. Does the tofu say firm because I only seem to find silken tofu and really want to stop eggs … Apparently there is vegan eggs?